The Game Design team has been very grateful for all the feedback coming in for Battlerite Royale and have been looking into different aspects of the game to improve or experiment with going forward. One of the major points of experimentation is the number of players on the map – first upping the number from 20 to 30 during the Battlerite Royale Beta, and later we tested increasing the player count from 30 to 40 during specific time windows. The change to 30 was an obvious winner, while the impact of the change to 40 is still being analyzed and discussed internally. There are far-reaching ramifications of increasing the player count in the game ranging from technical concerns to map size, player distribution, and pacing throughout a royale match. For now, though, you and 39 friends are more than welcome to jump into a match in the private lobby! 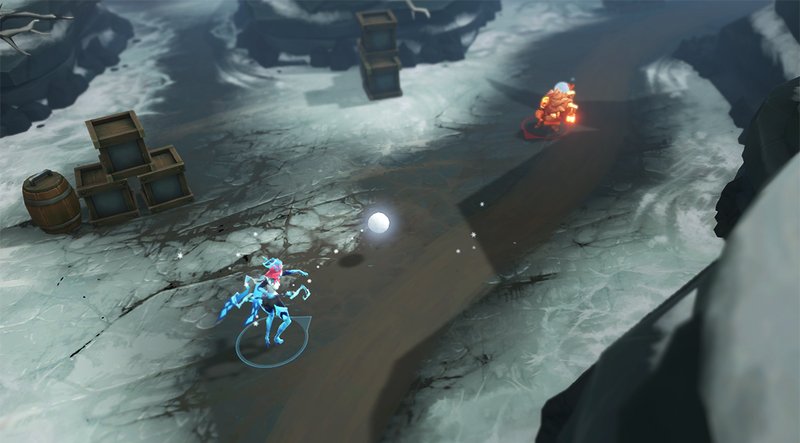 Recently, we’ve added a system that increases the chance for you to find missing abilities when you destroy loot orbs. While we’ve already addressed the topic of why you don’t start with a full kit in Royale in further detail before, we also want to make sure that players get a good experience using their abilities. This is also why we previously made the change to increase the starting abilities to two. We’ll continue to look at ways to strike a good balance between generating novel gameplay situations but also reducing the frustration of missing your last ability for extended periods of time. We’re also looking for other ways to create variation in each match; the winter patch will contain many new festive consumables. A big ongoing task for us is to bring Champions from Arena to Royale. The journey to convert each Champion has many considerations due to the needs of Royale. Overall mobility, deciding which Rites to promote to Legendary perks, item scaling, solo viability, and many more details are all considered. With Champions such as Ruh Kaan and Ezmo, who have particularly specialized playstyles, there are a lot of key aspects of their personality that we wanted to retain for existing fans of the Champion. It may seem like some Champions remain fairly unchanged, but we go through many iterations internally to find a compromise. And of course, a brand-new Champion is on the horizon. Originally we planned to release him only for the Arena, but decided it would be a better idea to introduce him to both games simultaneously. The progress of the tournament system is still ongoing, but we want to give you an insight of some of the exciting ideas we have for this long-awaited featured. It’s now apparent to us that delivering this feature will take more than just one patch due to the vast amount of potential and possibilities, some of which we’d like to share with you today. Our current plan is to release a basic Arena version of the system on a separate environment from live, with more details to come at a later date. Our goal for this initial release will be to offer something that players can try out and we can get an idea on how well it’s performing technically. Unfortunately, it’s unlikely this test version will contain all of the features we are envisioning for the final release due to time. 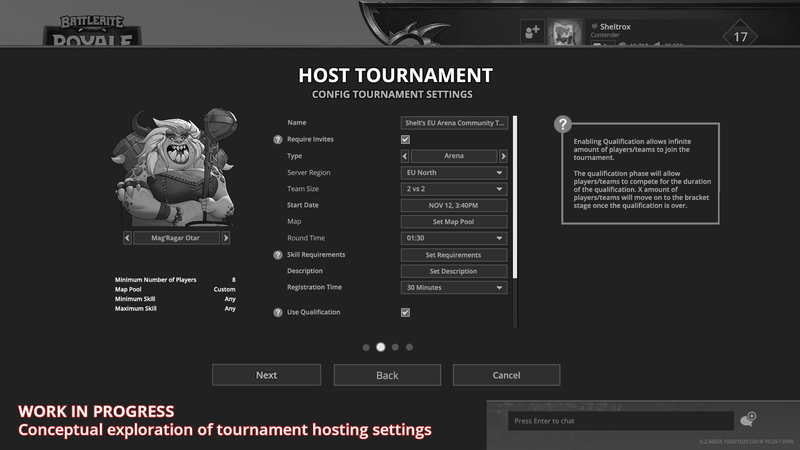 However, after the initial release, we’ll be able to continue to flesh out the additional parts of this feature that will eventually make it into what we aim to be an engaging re-imagining of the tournament system we had in Bloodline Champions. Your feedback and ideas will also be incredibly helpful as we’re finalizing these additional parts of the feature. 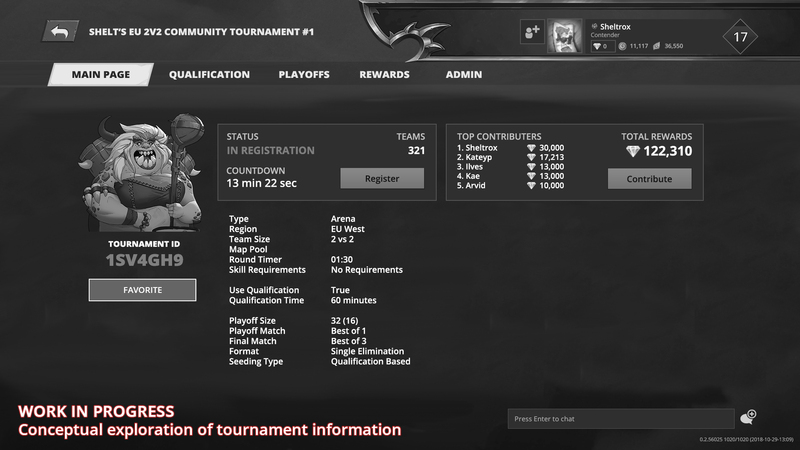 We started this project by taking ourselves back in time and analyzing the tournament system in Bloodline Champions, which was hugely successful but it did have a slight defect; Stunlock sponsored tournaments tended to outshine community ones. In Battlerite, we want to change this by bringing the community together and allowing players and organizations to host and admin their own tournaments. Additionally, we’re exploring ideas where players can contribute rewards to these community tournaments too! One thing that we’re currently trying to define in our user research is what our players expectations for the Tournament System are. It’s such a potentially huge feature that we can’t release it all at once, so what part should we do first? These are topics we are currently analyzing to define our priorities after the basic version of the system is available. We aim to provide detailed insight of what’s to be added to the Tournament System in the New Year. The art team is hard at work polishing up the new Champion. New Champions, in general, requires months of work from the team; from creating the basic look, to the outfits, poses, voice lines, animations, sfx, vfx, and more. This powerful new Champion hails from Quna, the homeland of Shifu and Raigon, and has little patience for the weak. 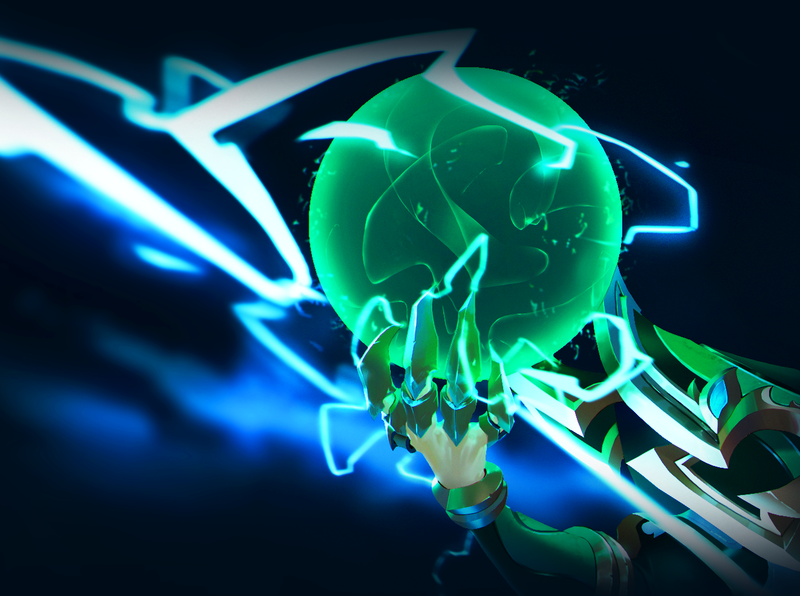 You’ll find out more about this mysterious Champion soon, stay tuned! 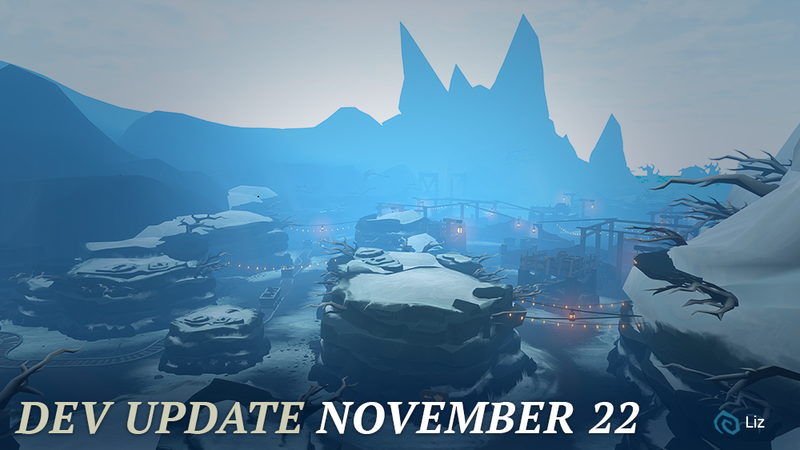 New winter content is also in the pipeline for December. 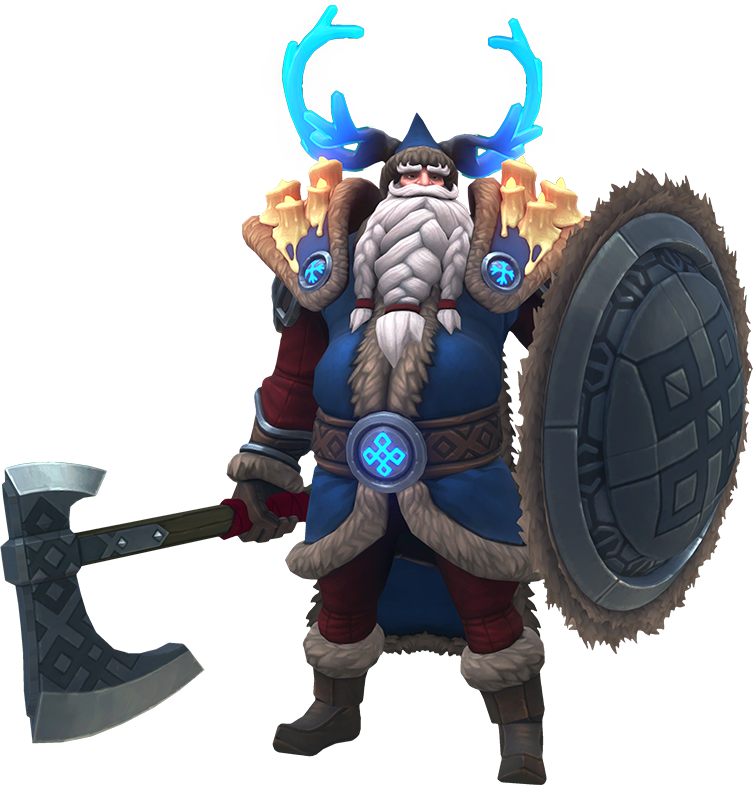 The yearly winter event is coming and there will be new legendary skins, poses, and weapons added on top of the existing content. Also, be prepared! You may find one or two surprises if you are visiting Talon Island during the event! The art team is also working on the Book of Lore, and has been continuing to create the art and stories found there to follow the weekly upload schedule. Make sure you check out the website to see the latest story! There are also emotes incoming and they are ridiculously cute. We are a couple of weeks behind on the schedule for them, but you don’t need to wait long. For the Winter Patch coming in December, you can expect 1 basic wave emote, accessible for all Champions, and 3 Rare emotes per Champion that can be unlocked via Chests, Diamonds or Tokens. There will be even more emotes coming in 2019! We hope you are excited for the Winter Patch and as always, thanks for playing our games! Your continuous support gives us the possibility to keep evolving the world of Battlerite and keep developing our games. With all this new information out there, we’ve gone ahead and updated out Roadmap to reflect the changes. Like we’ve stated before, we aim to hit the roadmap as closely as possible, but shuffling may occur.